ClickCease will monitor your PPC clicks with advanced machine learning algorithms. Separate real potential customers from fraudsters and bots that want to deplete your budget. Are a large scale dedicated click fraud operation, usually hired by your competition to remove your PPC ads from the search engine's result. Clicks on your ads with no malicious intent. Up to 50% of mobile ad clicks are because our thumbs are just too fat. Haters are a symbol of success (not only in rap music). The better your business is doing the more people will be out to get ya! The brains behind accurate click fraud detection. Our algorithm digests hundreds of fraud signals and knows how to accurately differentiate innocent clicks from click fraud. Every business suffers different types of fraud. 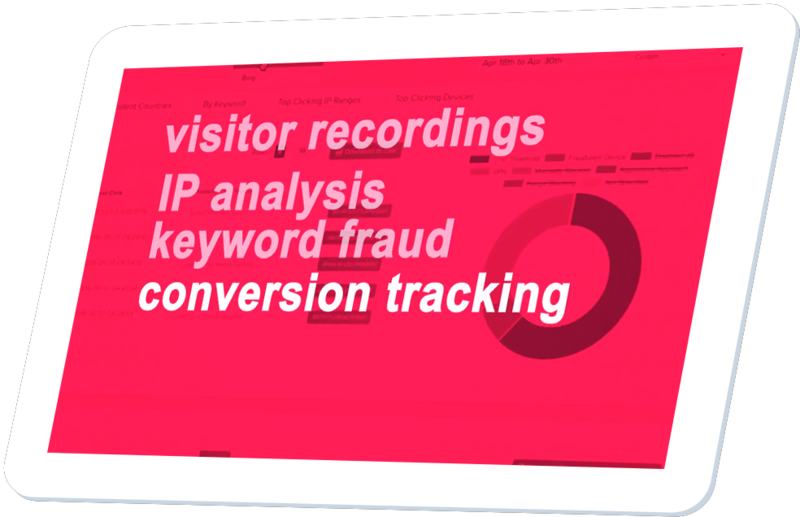 The click fraud detection tool can be easily customized for your specific industry. We tell AdWords not to show your ads to fraudulent sources, saving you time and a lot of money. Approximately 1 of 5 PPC clicks that you spend on are fraud. You will save a large portion of your ad spend when you block click fraud. Stop wasting your time and money with manual changes to your campaign IP list. We will tell AdWords in real time which IPs to block. Whitelist, blacklist, and set quarantine times (how long you want to block an IP) for all sources of clicks. Uncover the details behind the clean customer clicks and the dirty competitor clicks on your ads and set fraud fighting rules tailored to your business. Change the "I think it is" into an "I know". Watch a screen recording of your visitors' behavior on your landing page. See how their mouse moved, scrolled, and clicked. This behavior is part of the detection algorithm. Humans behave like you would expect a human to. Their cursor movements are natural with occasional clicks in places where clicks should be made. Bots are easily identifiable as non-human. Their cursor movements are erratic and very linear. They click repeatedly in random places to find buttons or links. Still googling your brand name, trying to figure out who is bidding on your keywords and how your competitors' ads rank against yours? Save your time with AdSpy! Get notified of new competitors and see your advertising ranks throughout the day.